Punching bags—often known as heavy bags—weigh anywhere from 70 to 150 pounds, with 100-pound being the standard size. On top of this dead weight, the pounding you give the bag imposes various dynamic forces, increasing the stress and weight load on the bag mount. All of this means that you must anchor a heavy punching bag to framing that is more than strong enough to handle the load. The only way around this rule is to use a freestanding bag that sits on the floor and doesn't hang from anything. 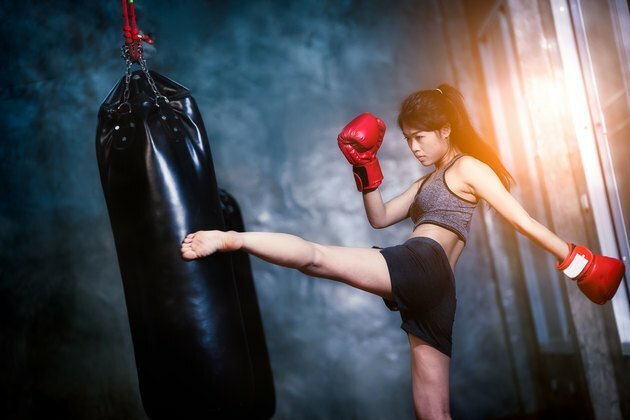 Punching bags have become popular as exercise equipment. You can buy various hardware devices for hanging a heavy bag from ceiling joists or beams or even from a wall, but the simplest and most standard method is to find an appropriately sized joist in the ceiling and anchor into it with an eye bolt. 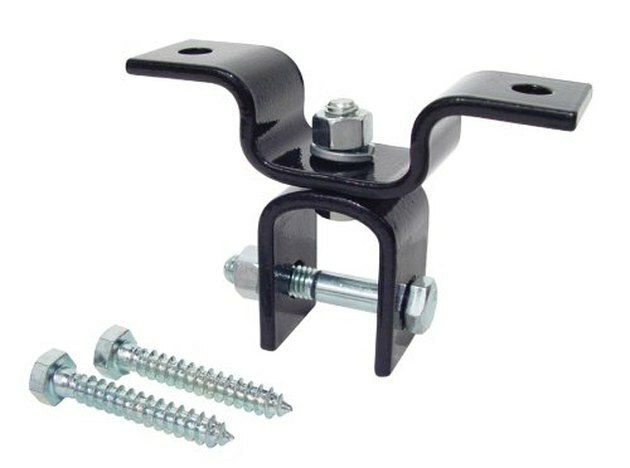 Hardware for mounting a heavy bag ranges from a standard bolt and carabiner from the hardware store to specialty "spider" mounts that anchor into two joists and offer 360-degree swivel motion. There are mounts that work on finished (drywalled) ceilings and those designed for exposed joists, such as you might have in a garage or basement. Exposed joists and beams also offer an even easier approach: hanging the bag with a strap that loops over the framing member. Commercial hanging hardware for joist mount. For a simple DIY mount, use an eye lag bolt, or "eye lag," which is a lag bolt with a closed round loop at one end. The bolt should be 3/8 or 1/2 inch in diameter and measure at least 3 inches on the threaded part of the shank. 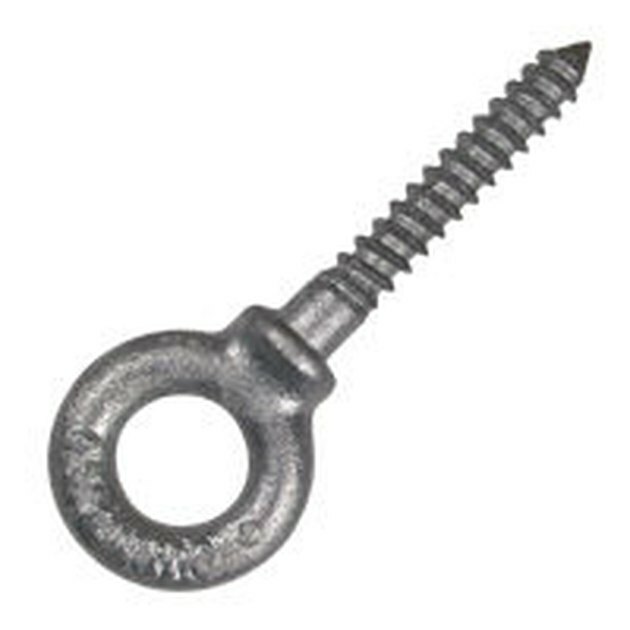 Use a forged eye bolt, which has a much higher load rating than a wire or turned eye bolt. An even stronger bolt connection can be achieved with a through bolt—an eye bolt with machine threads that you run all the way through the joist or beam and secure at the top with a washer and nut. You certainly can use a through bolt (if the framing is exposed), but it's really more strength than you need. If you don't have a suitable ceiling or floor frame above, you can opt for a wall-mount, in which the bag hangs at the end of an extended arm. These typically must be mounted onto horizontal wood blocking installed across a pair of wall studs. The crossbars on the mounts have holes for driving lag bolts into studs, but the holes are too close together to fit standard stud spacing, thus the need for blocking. Mounting a punching bag in a garage or unfinished basement is a cinch because the joists are exposed and chances are they're plenty strong enough for the job. Finding suitable anchor points in a finished ceiling or elsewhere can be a little trickier. The first thing to determine is the joist size. If there is a floor above the ceiling, you're good to go, as these are floor joists that are sized for the load above. If the ceiling is in a closet or below an attic, these may be just ceiling joists that could be as small as 2 x 4s. A 2 x 4 joist can probably hold a heavy bag, but it could flex enough to cause cracking in the ceiling drywall or plaster. Go into the attic and measure the depth (top to bottom) of the joists. If they are at least 5 1/2 inches (2 x 6s) from top to bottom, you're good to go. If they're smaller than that, you should anchor into two neighboring joists, using wood blocking that is anchored to both joists. The blocking can be attached to the surface of the drywall, or between the joists above the drywall. There is also mounting hardware available that anchors into multiple joists. Another place you can hang a bag is inside a wall opening or in a doorway that doesn't have a door. These openings are framed at the top with a horizontal beam called a header that spans across two studs to create the open space below. However, this location is most reliable in load-bearing walls, which are sure to have a sufficiently large header. Openings in non-load-bearing walls (and especially openings for wide closet doors) may have single 2 x 4 headers that aren't suitable for anchoring a punching bag. Use a stud finder to locate the ceiling joist in a finished ceiling. Mark both side edges of the joist, then mark a drilling point at the joist's center. If the joist (or beam) is exposed, simply make a drilling point at its center. If you don't have a stud finder, use the old-fashioned method of tapping on the ceiling to listen for the joist, then confirm the joist location by driving a small finish nail through the drywall until you hit wood. Locate both sides of the joist so you can mark its center. Drill a pilot hole for the eye bolt at the drilling mark. Use a 3/16-inch bit for a 3/8-inch bolt or a 5/16-inch bit for a 1/2-inch bolt. Make the hole the same depth as the threaded portion of the bolt, and add 1/2 inch if the ceiling is drywalled, to account for the thickness of the drywall. Insert the tip of the bolt into the pilot hole and tap it a few with a hammer so the screw threads bite into the wood. Begin turning the bolt clockwise by hand while applying upward pressure. When it's too hard to turn by hand, turn the bolt with a pair of pliers, or slip the shaft of a long screwdriver through the eye of the bolt and use it as a lever to turn the bolt. Drive the bolt until the threads are fully buried in the wood. Clip a heavy-duty carabiner or similar closed-link hanging hardware onto the eye bolt. This is safer than a simple S-hook, which can slip out of the bolt. With a helper, lift the punching bag and clip the bag's hanging chains onto the carabiner, making sure the gate on the carabiner locks closed. Now you're ready to give that bag a beating! A locking caribiner should be used to hang the punching bag.